"I came up with this salad when I realized I had some leftover salad items that needed to be used up. It's refreshing and light! It can be easily adapted to include your favorite salad ingredients." 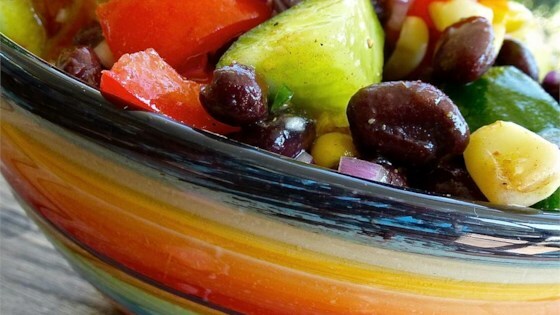 Toss cucumber, black beans, tomatoes, corn, and onion together in a large salad bowl. Whisk olive oil, orange marmalade, lemon juice, honey, and cumin together in a bowl; season with salt and pepper. Drizzle the dressing over the cucumber mixture; toss to coat. I was looking for a new use for black beans and this recipe seemed interesting. Its fresh with a hint if sweetness from the honey and jam. I did substitute peach jam instead of marmalade. Made as directed. It was edible but nothing fantastic. Too much sweetness. This salad was delicious - a really fresh flavour combo. I didn't have any honey so omitted that and it was perfect, I don't think I'll use honey when I make this again. Thanks for the recipe! I have made this twice in the last week and LOVE it. Yum!